Businesses can start filing their first tax return under the new Goods and Services Tax (GST) regime as the GST Network has started the facility for return filing and paying taxes on its portal. The GST returns for July and August will be filed on the Goods and Services Tax Network (GSTN) portal by filling up GSTR 3B form in which the taxpayer needs to provide consolidated details of outward supplies and input credit. The taxpayer has to file a summary of self-assessed liabilities, input tax credit (ITC) and details of tax payment. The last date of the filing the GSTR-3B for July 2017 is August 20, 2017, and the same for the month of August 2017 is September 20. 1.Type www.gst.gov.in and log into the GST portal with valid credentials. 2. After doing so, go to perform the following steps by clicking on: Services > Returns > Returns Dashboard command. 3. After the File Returns page, select the financial year and the return filing period (month) for which you want to file the return and click on Search. 4. The File Returns page will appear. This page displays the due date of filing the returns, which the taxpayer is required to file using separate tiles. 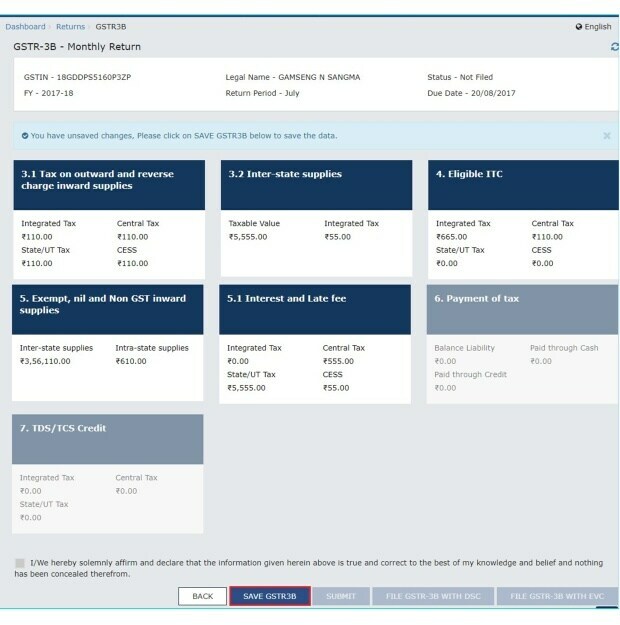 In the GSTR-3B tile, click the ‘prepare online’ button. Tax on outward and reverse charge inward supplies: This is to provide summary details of outward supplies and inward supplies liable to reverse charge and tax liability thereon. Inter­state supplies: This is to provide details of inter­state supplies made to unregistered persons, composition taxable persons and UIN holders and taxes. Eligible ITC: To provide summary details of eligible ITC claimed, ITC reversals and ineligible ITC. Exempt, nil and non-GST inward supplies: To provide summary details of exempt, nil and non-GST inward supplies. Interest and late fee: To provide summary details of interest and the late fee payable. Payment of tax: To provide the details of payment of payable taxes, interest and late fee. 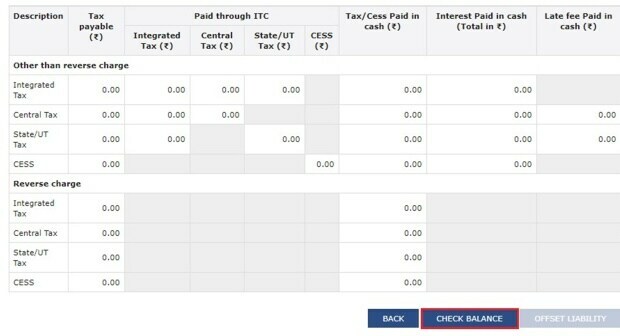 After performing the above-mentioned step, enter your total taxable value, integrated tax, central tax, state/union territory tax and cess as shown below. In case of other outward supplies (nil Rated, exempted ) and non­-GST outward supplies, the total taxable value imply the total values of such supplies, excluding taxes. Click on the ‘confirm’ button after reviewing your details. 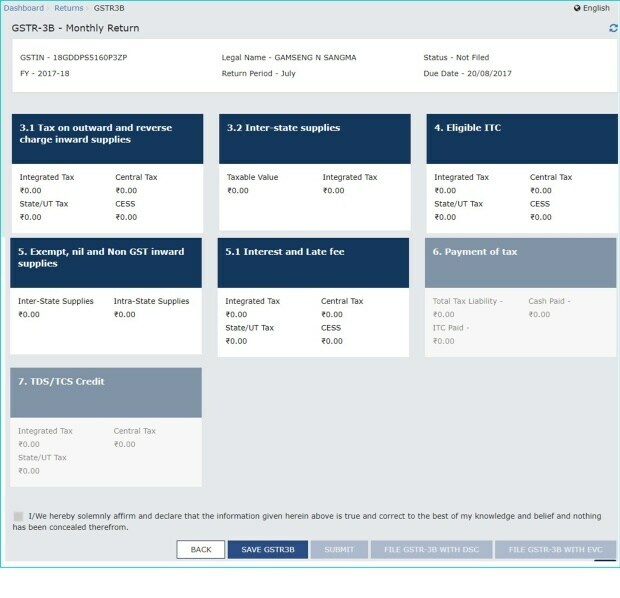 You will be directed to the GSTR3B landing page and the tax on outward and reverse charge inward supplies tile in GSTR3B will reflect the added data in a summary form. You should first click on ‘Save GSTR3B’ button at the bottom to save the data in the GST system, in case you want to exit at this stage and come back later to complete the filing. In the ‘amount of integrated tax’ field, enter the amount of integrated tax. At this point, you must ensure that the integrated tax amount provided here do not exceed the integrated tax liability declared. Click the ‘Add’ button to provide details of such supplies for another state. Note: Select the checkbox and click the ‘remove’ button to remove the data added. The system will accept only one entry for each place of supply. The details of tax paid on exports may not be entered here. In the section ‘Supplies made to Composition Taxable Persons’, from the place of supply (State/UT) drop­down list, select the place of supply. In the Total Taxable Value field, enter the total taxable value for each State/UT. In the Amount of Integrated Tax field, enter the amount of integrated tax. Please ensure that the integrated tax amount provided here do not exceed the integrated tax liability declared earlier. Only integrated tax amount has to be declared, cess amount is not required to be mentioned. Note: Select the checkbox and click the ‘remove’ button if you want to remove the data added. The system will accept only one entry for each place of supply. The details of tax paid on exports may not be entered here. The information regarding supplies to composition taxable persons has to be based on the information available with the taxpayer. Once all details are added, click the ‘confirm’ button. 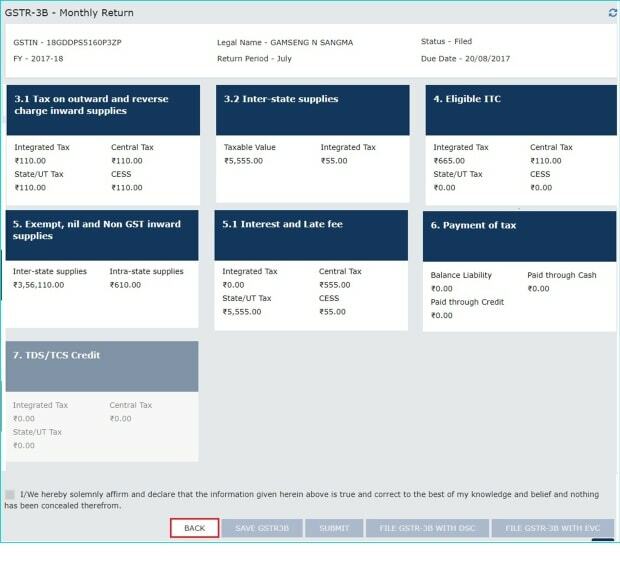 You will be directed to the GSTR-3B landing page and the ‘inter­state supplies’ tile in GSTR-3B will reflect the total of taxable value and integrated tax as declared in the details table. Again, it is ideal to save all your information in case you want to log out midway and resume it later. Enter the Integrated Tax, Central Tax, State/UT Tax and Cess vales under respective ITC claimed/ ITC reversed/ Ineligible ITC heads. After submitting these details, click on ‘Confirm’. 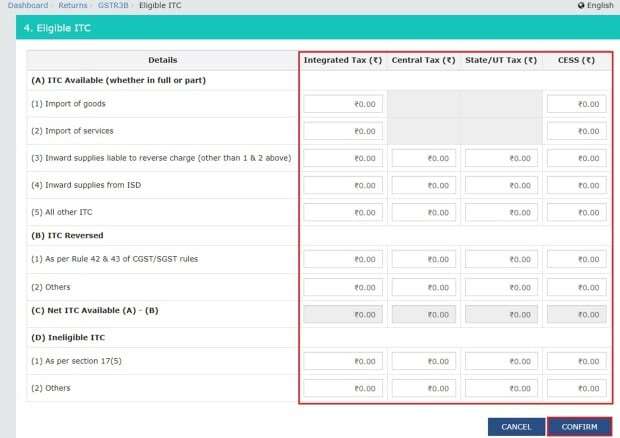 You will be directed to the GSTR-3B landing page and the ‘eligible ITC’ tile will reflect the total value of Integrated Tax, Central Tax, State/UT Tax and Cess net ITCs. Once again, save all your inputs before proceeding to the next step. Enter the inter­state and intra­state supplies under the respective section. After doing so, click the ‘confirm’ button. You will be directed to the GSTR-3B landing page and the exempt, nil and non-GST inward supplies tile will reflect the total value of inter­state and intra­state supplies. Save your details to avoid any mishap. Enter the Integrated Tax, Central Tax, State/UT Tax and Cess under interest and late fee heads. The late fee would be system computed based on the number of days elapsed after the due date of filing. You will be directed to the GSTR-3B landing page and the ‘interest and late fee’ title in the total value of Integrated Tax, Central Tax, State/UT Tax and Cess. Save your details before proceeding ahead. Once all information are added, click the ‘Save GSTR3B’ button at the bottom of the page to save your details. You will now get a message confirming that your details have been added successfully. Scroll down the page and click the ‘submit’ button to fill in the GSTR-3B. After filling in the details, you get a message saying that the GSTR-3B is submitted successfully. A success message is displayed at the top of the page that the GSTR-3B is submitted successfully. Once you submit the data, data is frozen and you cannot change any fields in this return. The ITC and Liability ledger will get updated on submission. Status of the GSRT3B will be changed to ‘submitted’. Note: Scroll down the page. The ‘payment of tax’ tile is enabled only after successful submission of the return. 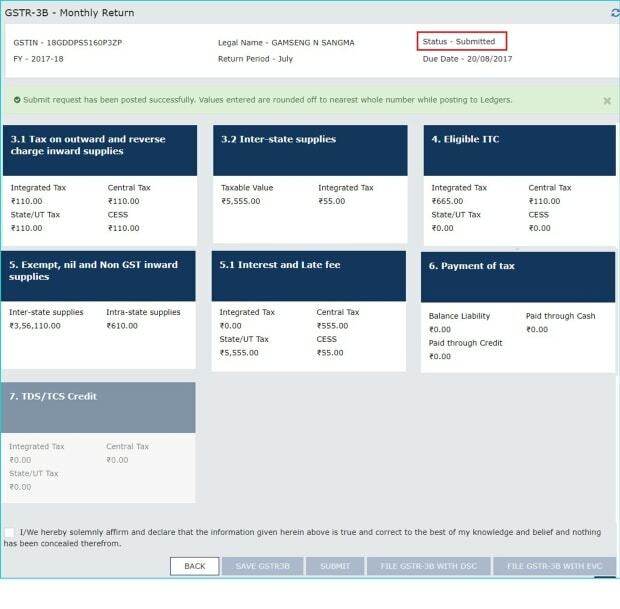 Note: Tax liabilities as declared in the return along with the credits gets updated in the ledgers and reflected in the ‘tax payable’ column of the payment section. Credits get updated in the credit ledger and the updated balance is available and can be seen while hovering on the said headings of credit in the payment section. 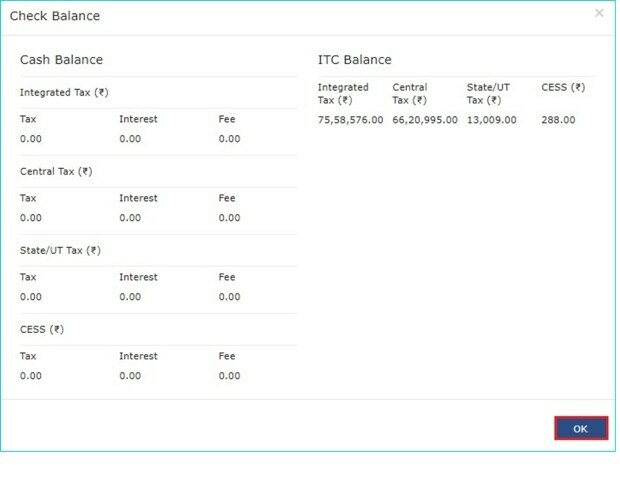 Click the ‘check balance’ button to view the balance available for credit under Integrated Tax, Central Tax, State Tax and Cess. The functionality enables the taxpayers to check the balance before making the payment for the respective minor heads. The ‘check balance’ page will be displayed. The page lists the minor head wise balance available as ITC and cash balance. Click the OK button to go back to the previous page. At this point, you are required to provide the amount of credit to be utilised from respective available credit heads to pay off the liabilities. You must ensure that the utilisation principles for credit have well adhered otherwise the system won’t allow for the offset of liability. Click the ‘offset liability’ button to pay off the liabilities. After receiving a confirmation message of your payment, click on the OK button. Select the checkbox for declaration. Select the authorised signatory from the drop-down list. Click the ‘File GSTR­3B with DSC’ or ‘File GSTR­3B with EVC’ button. 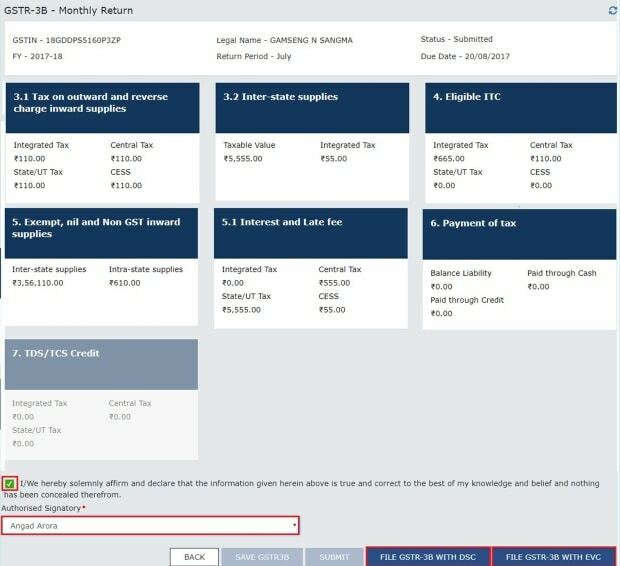 To file GSTR­3B with DSC, click on the ‘proceed’ button. Select the certificate and click the ‘sign’ button. Enter the one-time password (OTP) sent on your e-mail and mobile number of the authorised signatory registered at the GST portal and click the ‘validate OTP’ button. Click the OK button after successful submission of details. As you can see below, the ‘file returns’ page will be displayed as shown below. Select the financial year and return filing period (month) for which you want to review from the list. Then, click on the ‘search’ button. 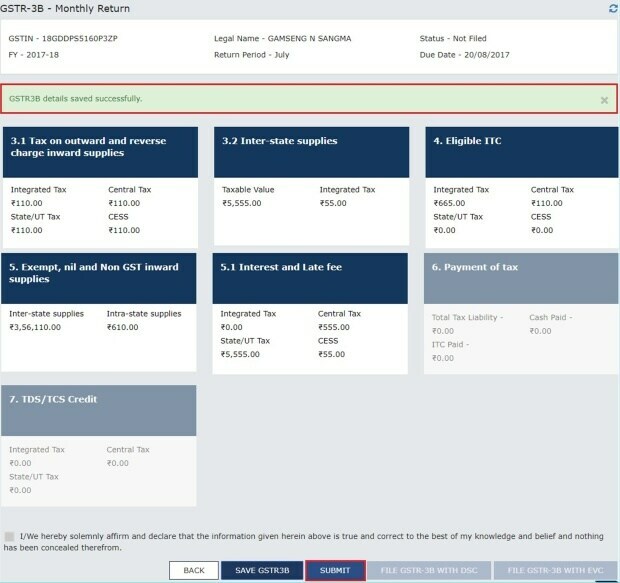 The status of the GSTR-3B return will finally change to ‘Filed.’ You can click on the ‘view GSTRT3B’ button to view your filed return. 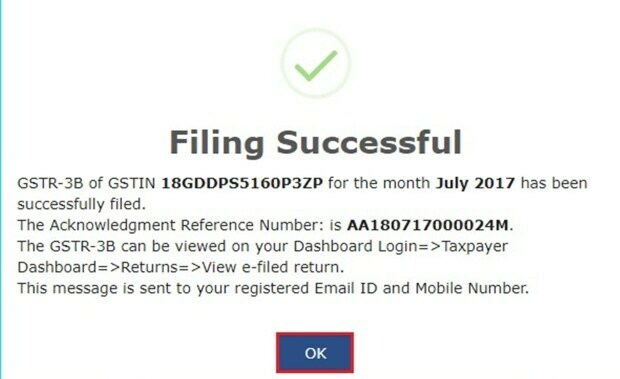 Congratulations, you have successfully filed your GSTR-3B return.